'Bonalu' is one of the official festivals of Telangana state. The festival is celebrated in Hyderabad in the Hindu month of Aashad. It is basically a folk festival and is a fine blend of history, mythology and culture. The festival takes place across the three main temples of Sri Jagadamba at Golconda Fort, Hyderabad, Sri Ujjaini Mahankali Temple at Secunderabad and Sri Maheswari Temple at Laldarwaja. 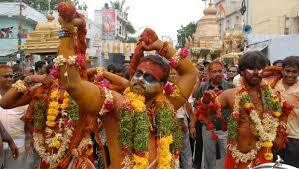 Devotees throng these temples with 'Bonalu' i.e food / meals to the deities as a gesture of thanksgiving. Bonalu is typically a traditional Hindu folk festival celebrated with much cultural fiesta in the Telangana region. This is a month long festival celebrated on Sundays in the Hindu month of Aashadam with colorful processions and community feasts. Goddess Mahankali and other local / village deities are worshiped and 'Bonam' is offered to the goddess. The festival begins with the offering of Bonalu to Sri Jagadamba at Golconda Fort on the 1st Sunday of Aashadam and ends with offering Bonalu to Secunderabad Ujjaini Mahankali on the last Sunday of the month. During the festival, the devotees go in processions to worship the village deity i.e. 'Ammavaru'. The women devotees dress up in their best in a traditional way and go in processions to the local temples with Bonalu placed on their heads. They visit the nearby temples to offer 'Bonam' to 'Mahankali' and Her other forms of 'Yellamma', 'Maisamma', 'Pochamma', 'Peddamma', 'Poleramma', 'Ankalamma', 'Nookalamma' and other such forms. The Telugu word 'Amma' means 'mother' and devotees worship the goddess to thank Her and for Her motherly affection / blessing on them. 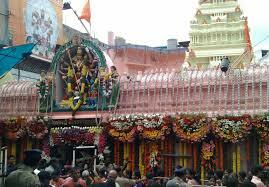 The festival is celebrated with much fervor in the twin cities of Hyderabad / Secunderabad. It is believed that even the then 'Muslim Rulers' (Nizams) of the region used to celebrate the festival and offer prayers to the local goddesses. Thus, the festival marks / reflects communal harmony of the region from the medieval times. The Telugu word 'Bonam' is originated from the Telugu word 'Bhojanam' which literally means 'meals' or 'food'. 'Bonalu' is the plural of 'bonam'. The women folk cook rice in milk and jaggery in new earthen pots or brass pot. The pots are then decorated with smear of turmeric powder, vermilion dots, fresh flowers and neem leaves. Women carry these pots on their heads and go in processions to the temple. They are accompanied by men who play rhythmic beats on drums. The women folk carrying 'Bonalu' dance with small taps to the rhythmic drum beats with praises to the Mother Goddess. They are also accompanied by the male dancers who are called 'Pothiraju' who are believed to be the protectors of the village. On reaching the temple, the women folk offer 'bonalu' to the goddess along with other offerings like glass bangles and saris. After the divine offering to Mother Goddess, devotees share the offering as 'prasad' among their family members and relatives. According to history, there was an epidemic of Potin 1813 in the present regions of Hyderabad / Secunderabad claiming thousands of lives. People in those days believed that the epidemic broke as a result of Mother Goddess's anger. Thus, they started the festival of 'Bonalu' to pacify the goddess and make Her happy. During this period, a Military Battalion that was moved from Secunderabad to Ujjain in Madhya Pradesh offered their prayers to Goddess Mahakali in Ujjain for the well being of the people of Secunderabad and promised to install an idol of Mahankali in Secunderabad. It is believed that by the time it is only after the prayers offered by the battalion, the epidemic was controlled. After returning from Ujjain, the battalion installed an idol of Goddess Mahankali at Secunderabad and thus kept their promise. They started offering 'Bonalu' to Goddess Mahankali. According to another belief, Goddess Mahankali visits her maternal uncle during Aashadam and people / devotees offer 'Bonalu' to Her as a gesture of their love and affection to Her. Devotees offer her a daughterly treatment, the way a married daughter is treated when she visits her parents. Pothiraju who accompanies the procession of 'Bonalu' is believed to be the brother of the goddess. He drapes a small tight red color dhoti (the traditional attire) with a bare body. He ties traditional bells to his ankles with a smear of turmeric powder on his body and kumkum / vermilion on his forehead. He ties a garland of neem leaves around his waist. He has a whip / coir rope in his hand, he lashes the whip and dances to the rhythmic drum beats. He always accompanies the procession of 'Bonalu' and is believed to be the initiator of the festival celebrations. He is also considered as the protector of the community. Rangam is an event of the festival which has special important. A woman invokes Goddess Mahankali onto herself. She gets the power of foretelling and devotees keep questioning her about their future or other such things. Ghatam is the Telugu word for pot. 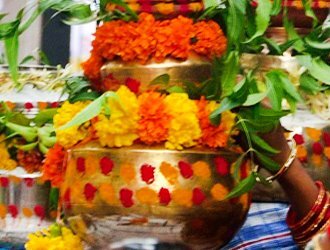 In the festival, a copper pot is decorated with flowers in the form of mother goddess. This 'ghatam' is carried by a priest who is dressed in the traditional way with a dhoti and a smear of turmeric on his body. The 'ghatam' is taken in procession from the beginning of the festival till the end of the festival after which it is immersed in water body. The procession of ghatam is accompanied with drum beats and dances. Bonalu festival is one of the important festivals in the Telangana region and is celebrated with much devotion.